At Aerowerks, It’s About You! Aerowerks brings new solutions to the table. 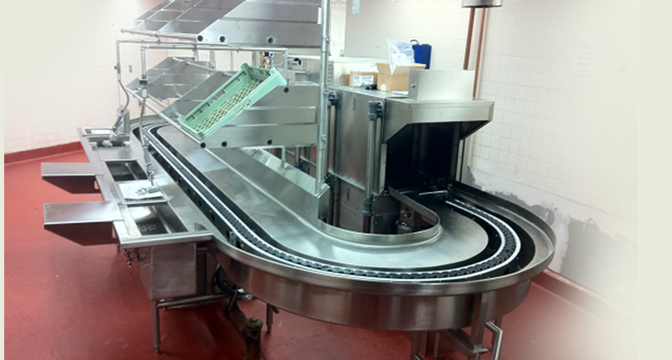 Aerowerks specializes in the design and manufacture of material handling systems for the food industry. Aerowerks has earned a solid reputation for innovative and efficient material handling systems. Renowned for our quality craftsmanship and strong engineering base, we continue to be selected over the international competition with systems installed on 6 continents. Working with foodservice professionals since 1975 on over 2000 projects. Our Commitment to you. We are committed to provide foodservice professionals the best design. As a Kitchen equipment contractor, you play a critical role working with the foodservice consultants general contractor and all the sub trades for each project. At Aerowerks, we understand each dishroom is different, as are the soiled ware handling and ware wash requirements.Therefore we carefully review your operations from drop-off to soiled breakdown. Resource Center – Operation Manuals, Maintenance Manuals, Sales Presentation b. Sales Activity Report, Current Projects/Proposals. Let us support you with all the content you need to make sure that our systems are maintained easily for our customers. In 1991 Aerowerks and Hobart formed an alliance to offer the Food Service Industry a one- stop- shop solution for Dishroom needs. This alliance brought together the two preferred brands in the Industry – Aerowerks Conveyors and Breakdown Tables along with Hobart’s Warewashing and Waste Systems. We are delighted to partner with Hobart in offering you the very best design solutions and exemplary service for all your Dishroom needs. William Caruso & Associates, Inc. has had a long history with Aerowerks for complex warewashing and conveyor systems for a variety of projects. I am pleased to write this letter on behalf of Aerowerks. With over 40years of experience as a food service contractor and consultant I have worked with Aerowerks and Aerowerks personnel for many years. I want to thank you for your work on my projects. As you know, this is perhaps the highest profile building in the world at this point and the logistics have posed enormous challenges. I have been meaning to write you to thank you and your team at Aerowerks for the terrific job you did for me and my client at UNT. I cannot believe how well this challenging project went without a hitch.